Toll Bridges can be an annoying addition to a journey when you have absolutely no change in your car but if you stock up on coins, however, there are some breath-taking bridges that you’ll be delighted to pay for the privilege of driving over. Some of the greatest construction jobs have gone into building these bridges and now tourists as well as travelers get to see and experience the longest, the highest, the busiest, the nicest and the most expensive. The architectural designs and visions that go into these constructions are remarkable to see built; this is your definitive guide to Toll Bridges of the World! San Francisco is home to Alcatraz prison, Ghiradelli chocolate and one of the most famous bridges in the world. The Golden Gate Bridge was opened in 1937 and celebrated its 75th birthday this year. A darker side of the bridge was shown with a display of 1,558 pairs of shoes – each representing a death leap from the bridge. It is the world’s ‘most popular suicide bridge’ but was not constructed for this purpose. 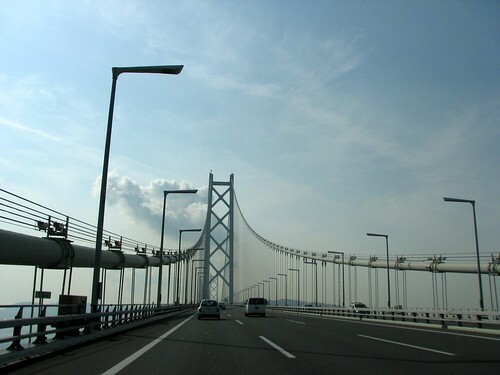 Akashi Kaikyo or “Pearl” Bridge in Japan holds two claims to fame: being the longest suspension bridge and the most expensive toll bridge in the world. It is the equivalent of 4 Brooklyn Bridges (3,911m/12,831ft) and costs ¥2300 (£18.50) to cross. It’s probably Japan’s greatest engineering achievement – taking two million workers ten years to build. The Millau Viaduct Bridge in France is the highest road bridge in the world. It opened in 2004, the brainchild of engineer Michel Virlogeux and British architect Norman Foster. At its highest – 340m (1,125ft) – this bridge is taller than the Empire State Building. It cost €400m (£310m) to build, so don’t begrudge the €7 (£5.50) to cross such a spectacular bridge. The complex Jiaozhou Bay Bridge lines up and connects Qingdao and the Hungdao in China. Think of Spaghetti Junction, put it on water and you get the picture. With an aggregate length of 26 miles (41.5km) it is the world’s longest over-water bridge. Plus, it’s an absolute bargain at ¥7.70 (70p). Definitely the coolest way to travel between countries in a car, the Øresund Bridge links Sweden and Denmark. From Denmark you take the underwater tunnel to a man-made island in the middle of the strait called “Peberholm” (to complement the nearby existing islet called “Saltholm” – cute). Then emerge into daylight from Pepper Island onto a massive over water bridge. It’s pretty steep at 310DKK (£33) but cheaper than a plane! The Sunshine Skyway Bridge is in sunny Florida (of course) and just $1 will allow you to span this 4.1 mile long, 400ft tall bridge over turquoise waters. The Travel Channel rated it 3rd in its “Top Bridges of the World” list. The latest incarnation of the Skyway replaced the original 1954 bridge, which collapsed in 1980 following a shipping disaster. The George Washington Bridge joins Manhattan in New York City to Fort Lee in New Jersey. It is busy. Really busy. Each day 280,718 cars cross the bridge, which has 2 levels and 14 lanes, that’s over 100 million a year. The 45mph speed limit is rarely needed, as congestion is so bad! At its worst it can take over an hour to drive just 11 miles of the stretch of road either side of this bridge. You only have to pay when traveling eastbound – $12 (£7.50). The Grafton Bridge in Auckland shouldn’t really make this list, as it’s not technically a toll bridge. But… you’ll pay the price if you drift into a designated bus lane between 7am-7pm. The hefty $150 (£75) fine has caught out an unbelievable number of drivers. Local authority coffers have been significantly increased with $124,000 worth of fines in just 5 days ($35 a minute)! Thank you to the Telegraph Construction Jobs team for bridging this article together! That bridge in France is gorgeous. I would happy to pay a toil to drive over it but then again, I don’t live and I would only have to pay once. Every time we go to Brooklyn from PA we have to go over both the Gothals Bridge to Staten Island and the Verrazano into NY. Both are ridiculously expensive (from a Pennsylvania point of view) and the Gothals is always under construction, adding insult to injury. (Or visa versa.) But the Verrazano Narrows bridge is one of the most beautiful bridges I’ve ever seen. 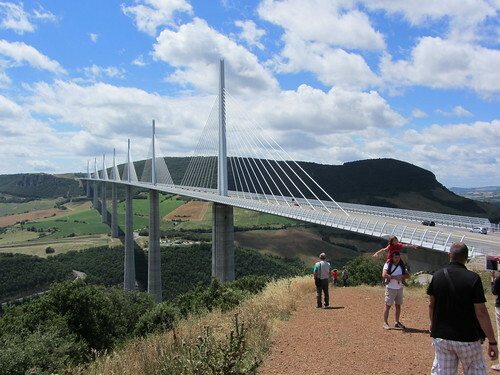 Millau Viaduct Bridge in France is so beautiful. In Colorado we don’t have any toll bridges, just a couple of toll roads around Denver. I would love to go see most of these. I definitely agree with the one in NY/NJ being the busiest, it’s crazy the traffic there.